VistaClean Irrigant Solution, an aqueous cleaner, is derived from citrus botanicals and has the ability to emulsify contaminants, soils, and oxidation products in waterlines, which protects the lines and system components from deposits and scale. 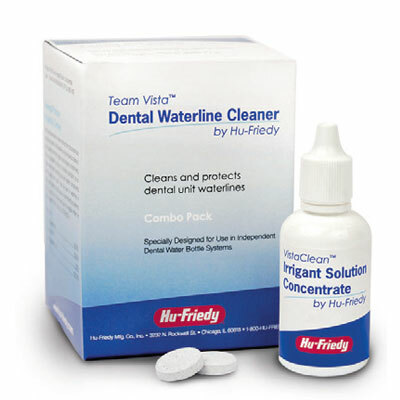 VistaTab is a tablet used for the cleaning of microbial contaminants in dental unit waterlines. When placed in water, the solid tablet quickly dissolves to create a noncorrosive solution that is 7 times more effective than bleach.